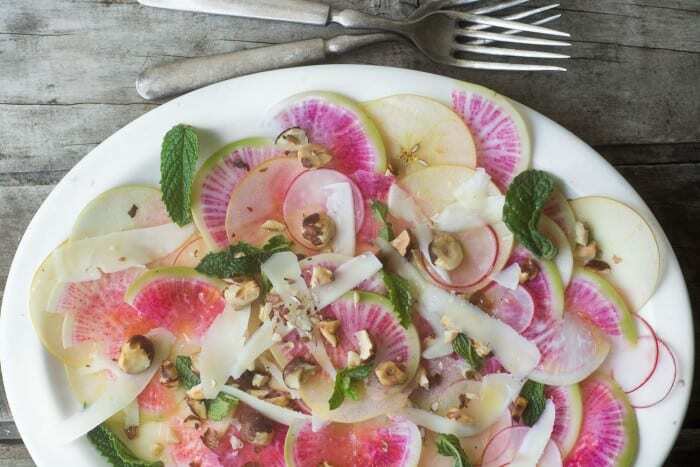 The pastel shades of this Shaved Apple and Radish Salad just scream spring — it’s perfect for a Mother’s Day or Easter brunch, or maybe a date night dinner for two — I feel lighter and healthier just looking at it! 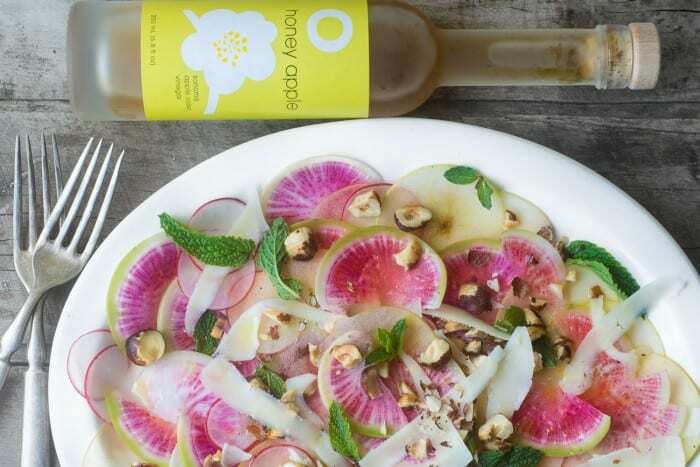 *This Shaved Apple and Radish Salad is in association with O Olive Oil — if you haven’t experienced this line of gourmet artisan oils and vinegar you are truly missing out. Have you had a shaved salad? They are so pretty and delicious. 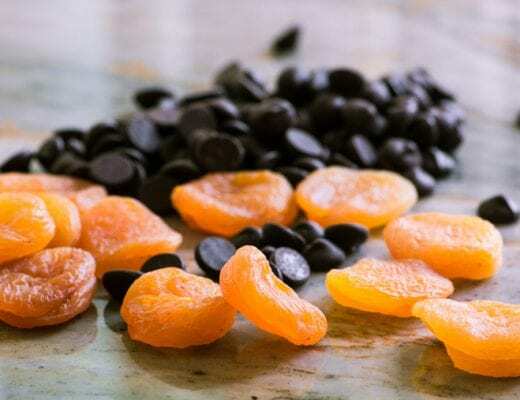 Instead of a bowl of greens, this type of salad is created by cutting vegetables — and in this case fruit — into paper thin slices on a mandoline. The slices are so thin that even veggies that are usually served cooked can be eaten raw. There are endless combinations that make this a really fun concept to experiment with. I chose a rather simple one to start with. The sweetness of the apple goes nicely with the sharper radishes. A bit of mint, some buttery slivers of Wisconsin cheddar, and toasted hazelnuts finish this off with panache. As I’ve said so many times, though, it’s the dressing that makes the salad, and for this one I turned to my collection of O olive oils and vinegars. Their Honey Apple Vinegar is incredible — pop the cork and take a whiff, the scent of cider and honey is heavenly. For this type of salad you don’t want anything heavy, so I just made a simple vinaigrette with the Honey Apple vinegar and O’s Extra Virgin olive oil. Delish!! Shaved salads are super healthy and have lots of potential for creativity, both visually and in terms of flavors and textures. They’re different from slaws in that the ingredients are cut into paper thin slices rather than shredded. It makes a nice special occasion dish because the presentation can be spectacular. In this case I’ve used a small Gala apple and two types of radishes, along with fresh mint and toasted hazelnuts. 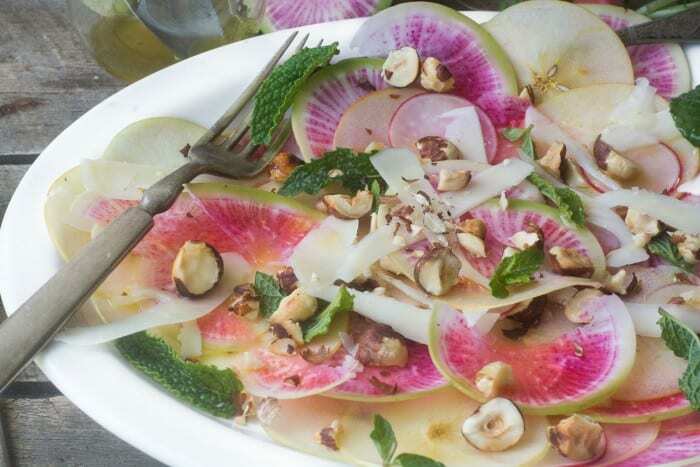 The colorful Watermelon radish has rays of fuchsia inside a pale green rind, it’s one of those specialty veggies that is becoming more popular and therefore more available every year. Ask your produce manager about them. Try my SHAVED WINTER VEGETABLE SALAD too! Yes, you know what I’m going to say, you absolutely need a mandoline for this dish. The apples and radishes need to be sliced paper thin, so that they are flexible and translucent. Don’t pile this into a bowl, layer it out onto a nice white plate or platter so you can see the shapes and colors. 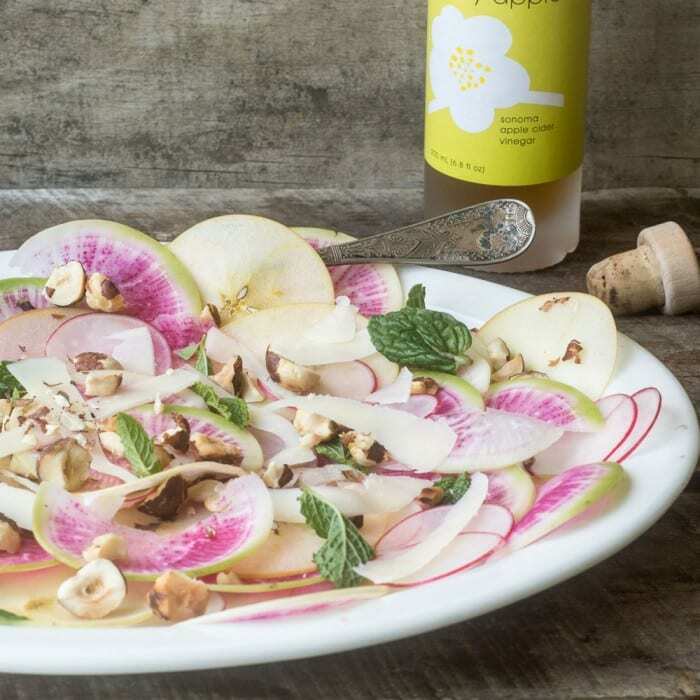 Don’t forget to pin this Shaved Apple and Radish Salad! What a fantastic salad! Totally different than anything I’ve ever made….but I’ve never met a salad I didn’t love! This is one gorgeous salad! I need to keep an eye out for that type of radish! I love all the flavours and textures that you have in here! Your creations always have the most beautiful colour combinations, Sue! I have a number of dinners to go to this weekend and I’ll be making this for one of them. Can’t wait to share it! Such a gorgeous salad, I’m totally craving it. So fresh!! Such a beautiful salad!! I love the radishes in this! i have a new appreciation for radishes–they can be SO beautiful and delicious and zippy! this salad is stunning and i love the dressing and the crunch from the nuts. You make the most beautiful salads I’ve ever seen. This looks like something to experience instead of gobble up – eat bite leading you to the next. A gorgeous plate! What a delicious salad for spring. Absolutely gorgeous!! This salad is so pretty! You have such an artistic eye. I love the way you put plates together. I would have never dreamed up this shaved combo but it looks so good. I bet pear would be nice with the hazelnuts and radishes as well. Thank you for yet another gem Sue! I agree, this would be a great fall inspired salad too, and pears would be perfect. 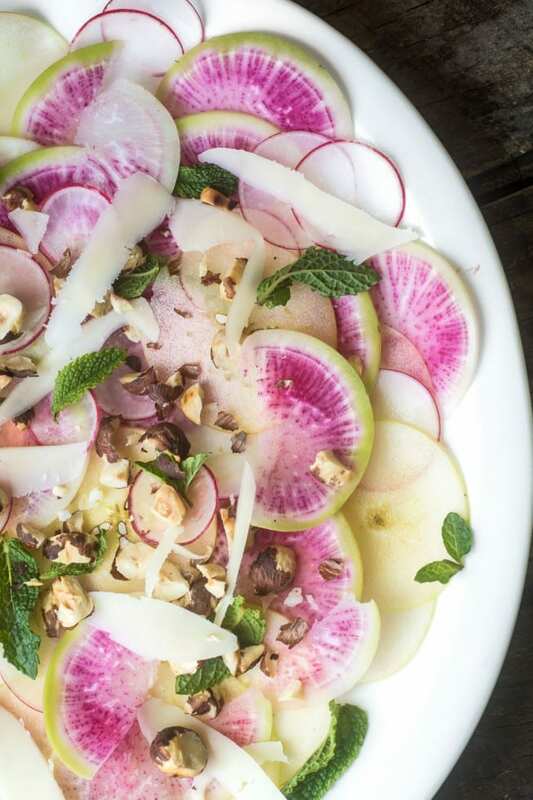 This salad is almost too pretty to eat, I LOVE watermelon radishes! This would be perfect for a dinner party. What a delicious idea! Never thought of shaving fruit and veggies into a salad, but it works! I have take out our mandolin and use it more often. Beautiful salad Sue! 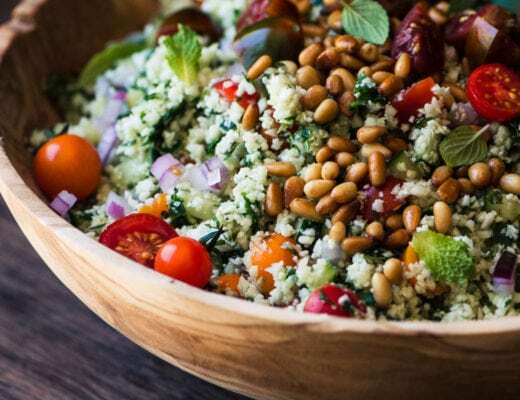 What a great combination , anything with hazelnuts gets my attention and this salad looks fantastic. Such a pretty and light salad, perfect for an alfresco spring dinner! Hi Sue, there were some gorgeous watermelon radishes at the farmers market this week-end but I glossed over them thinking that I just did not know what to do with them with except maybe use as a garnish. Beautiful idea, love shaved salads, yours are always amazing! This looks fantastic. I am addicted to your detox salad and have addicted my daughter as well. I won’t find watermelon radishes here on my rock, but I found the place to order seeds for those and rainbow carrots, etc. I need to do that soon so we can enjoy some of these great fruits and veggies here. 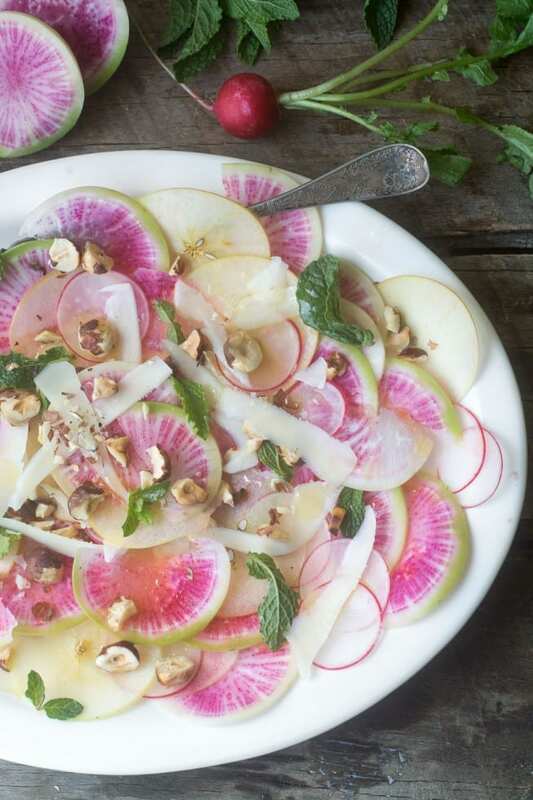 Those watermelon radishes are beautiful! I don’t think I’ve seen them offered here yet but the salad is wonderful idea and the combination sounds delicious. I was saying to another commenter that radishes are becoming super hip lately, I bet you’ll see different varieties available to you soon. There’s a cool black radish that I’m dying to find. WOW – that is so so pretty!!! Well, how pretty is that salad?! It is calling my name Sue and screaming spring! So lovely, this would be so fun for a girls event. Love those radishes, they seem to scream spring! Yes, and how about a girl baby shower? I love how colorful this is! So pretty and perfect for Spring! Gorgeous and perfect for the season! Love the hazelnuts and cheddar in this salad. Would be perfect for a celebration brunch (no table dressing required)! What a pretty salad. I never would’ve thought of radishes. Love the addition of hazelnuts for the extra crunch. Thanks Ali — I’ve been seeing radishes all over the place in recipes lately, braised, roasted, shaved, etc. They’re the new ‘it’ veggie, I think. 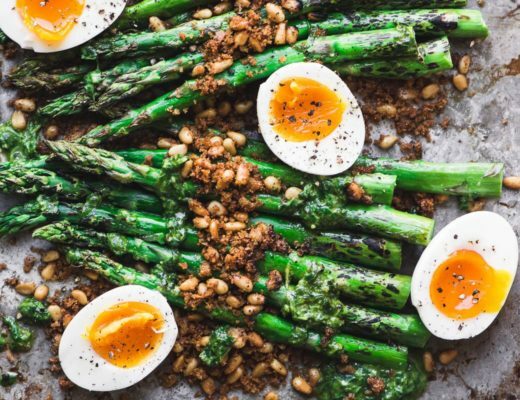 What a beautiful spring inspired salad! Sounds like a tasty combination! Thanks for sharing!